A teacher, an organizer, a leader, and a creator who turns the abstract into reality, Dr. Robbie Gholson is the Senior Minister of the City of Angels Church of Religious Science. Born the seventh of twelve children, Robbie grew up in Gary, Indiana, knowing from her youth that teaching was her calling. So strong was her vision that she managed to complete her bachelor’s degree in Elementary Education from Southern Illinois University despite marrying and raising two young children at the same time. In 1963, Robbie and family moved to Houston, Texas, where she had her third child. This is also where she began to realize her vision of improving the lives of others through education. With the desegregation of American schools, Robbie knew strong minority voices would be required to implement a fair transition. She joined the Citizens for Good School, which oversaw the district’s handling of the federal mandate and funds. Quickly elected President, Robbie positioned the group as an invaluable liaison between school administrations and parents, and she realized her talents in public relations. Still, challenging times tested Robbie’s mettle. While pursuing her Master of Education from the University of Houston, she realized that her marriage was irreparable, and with her daughter, she moved to Los Angeles to seek a change in life. To that end, she enrolled in the design school at UCLA, tapping into a creative side that had to that point been overshadowed by her organizational skills. Most importantly, she learned problem solving in terms of projects and people, as much of her education involved peer review and teamwork. Respecting everyone’s unique approach to the same subject became one of her core values. As that realization struck her, she met and fell in love with O.C. Smith, a jazz singer and musician known the world over, and they married on February 14, 1976. After earning her Certificate in Interior Design, Robbie entered the work force, applying her skills to set design for commercials. She and O.C. complemented each other perfectly; his flair for the dramatic and magnetic personality, and her meticulous nature and talents for instruction and administration. They shared a love for creativity in their own fields, and together, they covered every trait needed for success. Their lives would change forever on a Sunday morning, when Robbie and O.C. accompanied friends to a sermon by Dr. Joseph Murphy. He spoke about God in a way that Robbie never heard before yet knew implicitly. Invoking the “science of the mind” and describing God as metaphysical, Dr. Murphy spoke of the Lord in the way Robbie had always believed the One would be; omnipresent, uniting all people, and based on love for the world before us. O.C. too was struck, as this was how he believed God was, even though no ministry before had presented the Almighty in such a way. Together, Robbie and O.C. delved into the world of religious science, discovering a spiritual approach that suited all they believed was true. So touched was O.C. that in 1985, he became a minister, and following years of searching for the proper pulpit from which to share their beliefs, Robbie and O.C. opened the City of Angels Church of Religious Science that same year. The Church was a tremendous undertaking, and Robbie became a cornerstone through her management, design, and her first love, teaching. She brought members to the Church in droves, allowing O.C. to deliver his moving, entertaining, and comforting sermons extolling the God they knew to be the truth. So great was the response that the Church gained thousands of members, and in 1996, Robbie led them in relocating to a facility suited to their growing needs. Utilizing her creativity, design skills, and leadership, she painstakingly led the decoration, furnishing, and layout until the new location was visually stunning, so much so that even non-members would visit just to observe its splendor. 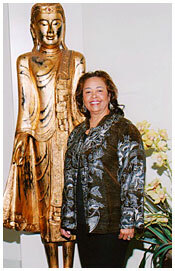 In November 2001, Dr. Smith passed, and Robbie, now ordained herself, accepted the position of Senior Minister and CEO of City of Angels Church of Religious Science. Dr. Robbie continues to lead the Church in spreading its word and welcoming all who wish to discover religious science.